← Did you know that dental night guards can save your teeth? 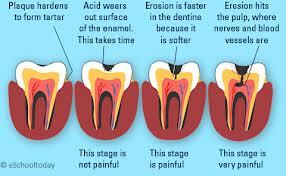 Tooth decay is when enamel of the tooth becomes soft and a hole is formed through it. There are various stages of decay. In early, stages of decay, the hole is initially small. One will not feel pain at this stage. As the cavity progresses with time and no treatment, the hole will become larger. There will be a point that it will get into the nerve of the tooth. At this time, one will inevitably feel the pain. How is a cavity treated? If the cavity is small, the tooth will usually require some local anesthetic. The areas that are soft and decayed will be removed by the dentist. The dentist will fill the tooth with a filling material that will be either white, composite (plastic/porcelain) material or a silver filling. If a cavity is deep and into the nerve, the tooth will require root canal, where the nerve of the tooth is removed. After this, there will be minimal pain, if any. However, the tooth will then require a crown to prevent breakage. Brushing regularly- twice a day, and flossing daily, will help prevent tooth decay. A healthy diet filled with natural foods versus sugary substances will on a general level help prevent tooth decay. Fluoride treatments can decrease decay by up to 30%! Getting regular check-ups at your dentist will help maintain a healthy mouth over your lifetime! This entry was posted in Uncategorized and tagged Cavity, composites, dental cavity prevention, dental health, san francisco cosmetic dentist, san francisco dentist. Bookmark the permalink.